I built this gate, almost 100% by myself (Brandon and I built the gate part together a couple months ago as part of another project that didn't pan out). I want to create a step-by-step guide (sadly, without pictures) to demonstrate how I created this wicked awesome gate, and how you can too!! self-closing gate latch (I spent about $5 at Lowes, but online the closest approximation is $10.67). power drill (the drill bits often come with the screws if they have weird heads--but pay attention to the head type needed--I bought the #2 Philips head for this project, and it was terribly helpful. trenching shovel (optional, but it was helpful with the really tough/rocky dirt. Step 2: Dig the post holes. Hopefully step 1 wasn't too daunting--it's easier from here on out. Determine how wide apart you want the posts to be--the basic frame for my gate already existed when I started, so I tried to do it around that, but the best way is to dig posts first, make gate second--because as you get going, you may have to change spacing, etc. As well as you can, decide where you want to position your posts and make sure they're on a straight line with each other. Dig your post holes at least 1/3 the height of your post. Since my posts were 8 feet each, I had to dig 32". Digging was the most labor intensive part of this process and took the course of several days to finish because my soil was so hard and rocky and then sandy so it kept slipping through the post hole shovels. The best way is to slam the post hole digger into the ground repeatedly until it sticks, then wrench the ends apart and pull the dirt out from the hole. RAIN TIP: put your posts in the post holes when you're done for the day, and then if it rains they won't fill in on you! Step 3: Fill up the Post Holes. I put in 5" of gravel, then inserted the posts on top. Now is a good opportunity to ensure your posts are of equal height. Put another couple shovelfuls of gravel around the post in the hole. Then mix the concrete: It's easy--for an 80lb bag, you only need 3/4 gallons of water. BE SURE TO WEAR GLOVES AND A MASK AND EYE PROTECTION. The curing process heats the concrete and can cause severe burns on skin contact. The concrete mix also contains silica, which can cause a serious lung condition called silicosis--just wear protection and you'll be okay. (technically, silicosis requires a LOT of exposure so this probably wouldn't be enough, but why take the risk?) All of these warnings make the concrete sound super scary, but it's really not. I tried mixing with shovels, but the concrete even when wetted has the consistency of wet sand and it was easiest to just dig in with my gloved hands. Knowing the consistency is helpful because it means you have some time to reposition and pack the posts in their holes to make them even. I mixed the concrete in my wheelbarrow and had just enough to make a 6-8" collar about 3 times the width of the posts at the top--make your post holes wider at the top so you get a lot of stability from the cement--the gravel will help hold it in place below and allow for drainage so your posts won't rot as quickly. Wash your wheelbarrow and tools off with the hose--you'll have time before it dries--it should take about 24 hours to be solid and will continue curing for at least a week before reaching it's maximum strength. Step 4: Make sure the posts are level. Hopefully you've made sure that your holes are straight, that everything looks all right and so forth, but now is the time to really make sure before things are literally set in stone. I used my level to make sure that each post was level front-to-back and side-to-side. I buried the concrete collars about 24 hours after I shoveled them in--I figure that will seal in the moisture and help it become stronger. Step 5: Build the gate! This part is really easy compared to the first few steps. Measure the distance between the fence posts, and subtract an inch--this is the width of your gate. The height is up to you, but you should plant to leave a three-inch clearance under your gate so that if the gate does start to sag a bit, you're not up a creek. Build your gate frame. 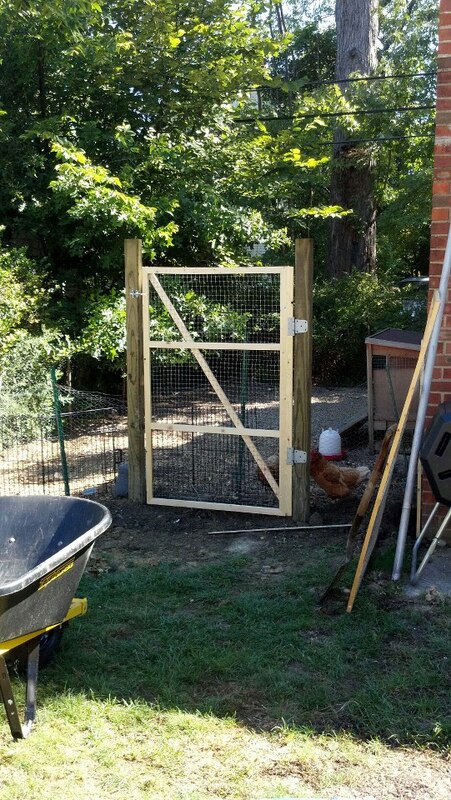 You are balancing weight, strength, privacy and durability--a picket gate will weigh more than mine, but it will provide more privacy and be stronger than my chicken wire, lumber model, but since this fence is geared at keeping chickens in their pen, I'm not too worried about strength. In our case, we built the frame by cutting the side pieces at an angle so they dovetailed together. Two people are needed to screw it together. Add cross-braces at intervals along the length of the gate and one long cross-brace diagonally from the bottom of the gate on the hinge side to the top of the gate at the latch side. Spray with polyurethane or other outdoor protective paint, then staple on the plastic/vinyl chicken wire to cover all the openings of the fence. (I literally watched a chicken crawl under 3 layers of rusty chicken wire to escape today so be sure to leave no holes). I thought it was easier to attach the hardware to the gate first, then to the posts. Use the 3-inch deck screws to really affix the galvanized hinges to the gate posts--use the shorter ones for the gate itself. Step 6: Affix the gate to the gate posts. And wonder why you didn't do this long ago!